Whether privately run or official, Outbreak has a number of businesses that provide trade and service to the survivors on the island. These businesses are also a great first step to explore and join to earn weekly pay. Players often band together for other role-play opportunity and is a great way to make new connections. Saving lives is what the heroes of the AES do. Whether patching up injuries or working on a cure for the infection, the AES are angels everyone will need someday. Welcome to The Eights, a part of Arklay that once offered Section 8 housing to the less fortunate. Now it is a little community banding together for survival. 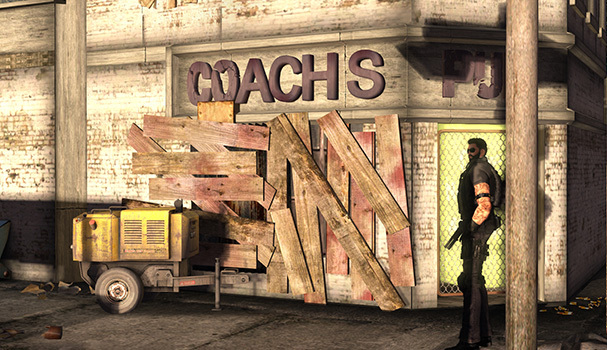 The trading post for small items such as candy, pop cans, and the smaller luxuries and essentials no-one thinks about but everyone needs, the store is essential to the survivors of Arklay. Fixers, mechanics, handymen, Dixon's keeps the town running and is the only supplier of fuel on the island. This is a private business soley managed by the tenant listed above. To join, please contact them. Coach's is the first stop for many a weary traveler on their arrival to Arklay, and the only place with bona-fide actual real booze--some of it might has been described as ‘nail-polish remover’. Hard Booze and Hot Chicks, Coach’s doors are open to everyone who needs a place to take a load off and drown their sorrows while someone else handles the Creepers for a change. The Parlour is a hotbed for seedy activity, entertainment, and the occasional manicure or cut and dye job in this forsaken world. From intelligence gathering to releasing pent up aggression, keep your patrons happy and coming back for more. Got the munchies? Need to place to stop and rest? Sam n Ella's has you covered while offering the most fresh to death bite to eat around Arklay. Stop on by and grab a seat, take a load off your feet, and have a little something to eat! The ATC is where you go when you don't necessarily have all the cash you might need to get what you want. Have some recourses on you that you could do without, or maybe you just need something else more? Bring it on down to us and we'll make you a fair trade. Looking for supplies that you can't seem to find locally, want a little excitement to change up your routine? Join one of our supply runs.. oh and don't forget our freshly grilled fish!